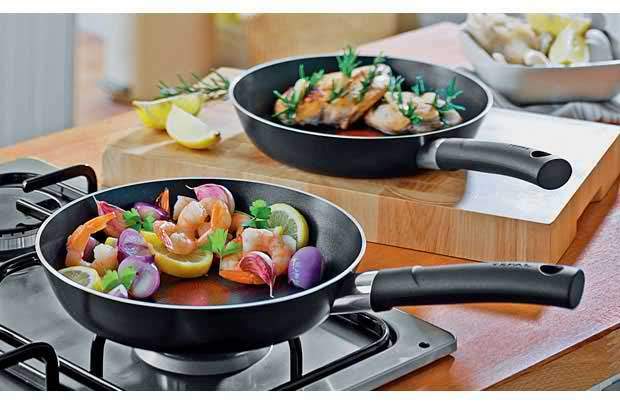 Set comprises 20 and 24cm Activ fry pans with thermo-spot, Tefal's heat indicator. Aluminium non stick outer coating with Thermo conductive base with copper speckles to ensure even heat distribution. New Expert non-stick with topcoat is metal utensil compatible. Manufacturer's Lifetime guarantee on non-stick surface. Suitable for Gas, Electric, Solid hotplate, Halogen and Ceramic hobs. Thanks fab_1 I've added an image to your post, for help on how to do this check out the links in my signature. We've had loads of pans, some of which have been very expensive, and Tefal are the only ones that we've found that seem to stay non-stick for good. We've got a few of these - very good. Not sure about testing the "metal utensil compatible" tho. thanks for this just reserved a set. managed to get a set reserved. is the deal available instore? Good price heat added pity they are small size frying pans. I've had a tefal pan for 2 years and it's still in good condition wheras my other cheapy (well not that cheapy really) non stick pan had lots of scratches on it and bits of the not stick coating wore off after just 6 months of use (with great care to use wooden spoons)....in the end it was rusting and flakes were coming off in the food so chucked it (had to chuck the one before that too) in favour of tefal. Price has gone up to £15.99 now.... not really expired.... just a bit more pricey. Here are the details of the item(s) you have reserved.